Warrnambool & District Historical Society - The Warrnambool & District Historical Society (WDHS) was founded in 1966 with the object of gathering material and items of local historical significance and preserving them for the enjoyment of future generations. Monday to Friday 10am to 12noon - 1.30pm to 3.30pm. Or by appointment. Public holidays by appointment. The collection is diverse and includes items relating to Warrnambool and district from the 19th century museum and other material collected by the three following historical societies established in early 1900s, post WWII and the current society. The collection consists artefacts, books, original documents, textiles, photographs, maps, oral histories and a research collection. History House is a registered Place of Deposit (POD) with local items lodged from PROV and Warrnambool City Council. Our collection tells the story of local and district business and families of south west Victoria and their link within the world platform. Stories of developing the district and transport by land and sea. Our material is displayed and available for researchers. This is a ledger (foolscap size) with a bound blue cover with red binding on the spine. 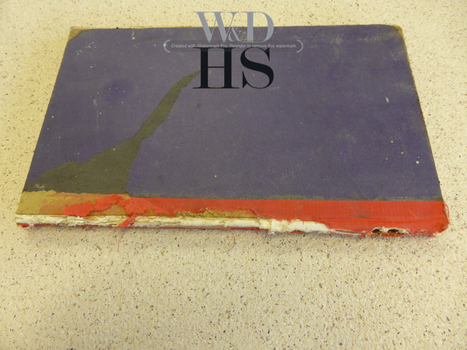 The red binding is in poor condition. The pages have alphabetical tabs and there is one set of 5 loose pages listing mortgages expiring in and before 1930. Entries are handwritten in blue ink. This ledger lists the 1920s and 30s mortgages which were administered by the Warrnambool legal firm of Mackay and Taylor. This firm arose out of the merger of the legal businesses of George Mackay and James Fletcher in 1893 and the subsequent acquisition in the 1920s of a partner, J. Taylor, to make the firm, Mackay and Taylor. This firm with added partners survived until the 1990s. The list of mortgagees and mortgagors in the ledger are summaries of the transactions of the borrowings and repayments. The ledger has some significance as it contains the names of some mortgagors and mortgagees in Warrnambool in the 1920s and 30s and the information would be useful to researchers. This is a buff-coloured cardboard box containing metal tacks. The box is torn away at the top and has black printing on two sides. The box has been covered with clear cellophane to keep the contents safe. The tacks have a blunt head and taper to a point. They are rusted. 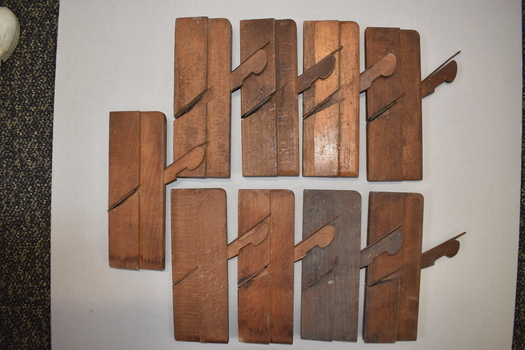 These tacks, made in U.S.A., would have been used in carpentry and small building processes and would most likely have been for household use. In many cases they have been replaced by clips and adhesive materials but are still used today. 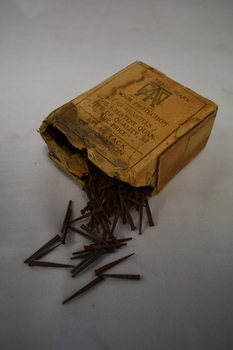 This box of tacks has no known local provenance and is kept for display purposes as an example of a household item from the past. 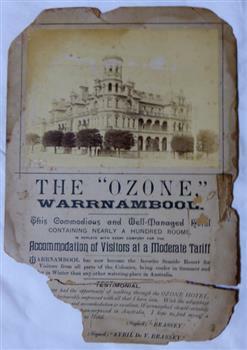 The Ozone Hotel was formerly the Grand Ozone Coffee Palace which was erected in 1890 at a cost of around ten thousand pounds. Coffee Palaces were temperance hotels which were popular in the latter part of the 19th century which offered recreation and superior accommodation. The coffee palace operated until 1915 and was then closed before re-opening in 1920 as Hotels Mansions. It had major renovations including a large theatre area. February 23rd 1929 saw the most spectacular fire in Warrnambool's history when the Hotel mansions was burnt to the ground. Evelyn O'Brien was granted a temporary licence and in September 1930 she was given permission to rebuild. The new hotel named Hotel Warrnambool was opened in March 1931. Hotel Mansions crest on front of plate, with Warrnambool in banner underneath. These are original newspapers of the Warrnambool Advertiser from 11th January 1871 to 27th December 1871. Each edition has two pages printed on each side. The cover is missing but the pages are bound with thin string to keep them together. The pages are unmarked with many torn edges with the Wednesday January 11th issue very tattered and the Saturday 14th January issue has pages 3 and 4 half torn off. There are some loose pages. These newspapers are most important as they are original copies of an early Warrnambool newspaper and the only copies the Historical Society owns. They contain much important information on Warrnambool activities and events in 1871. An index to the papers is available. 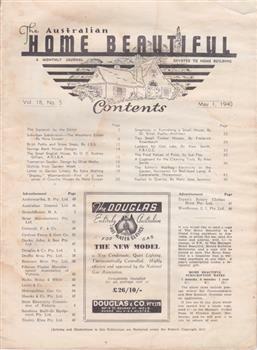 Cream cover with black text and circular emblem in centre of cover. The back cover has small text in the centre.140 pages. This report documents office bearers from the 1535 and a chronological list of fellows from 1873 up to 1932. 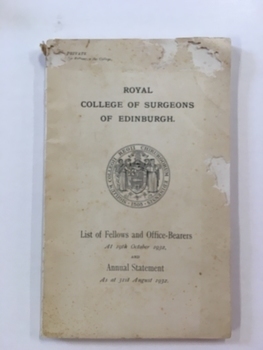 William Roy Angus a doctor who practiced in Warrnambool and to whom this booklet belonged, is listed among the fellows of 1928. It lists his contact details as C/- Mr W J Angus 37 Kermode Street North Adelaide South Australia. A link to a member of the Warrnambool community. December 1932. J W Dowden. Three circular slightly concave metal badges featuring the profile of an Australian soldier in a slouch hat blowing a bugle. The background depicts sunrise in yellow and orange colours and text. The outer edge is gold coloured . The reverse has a metal clip. These badges were produced in World War One in Australia to raise funds for the war effort. ANZAC Day is an important national holiday in Australia commemorating the landing of Australian and New Zealand troops on Gallipoli on 25th April 1915. The national day was instituted on 25th April 1916 and badges such as these would have been sold on the anniversary of the landing day. 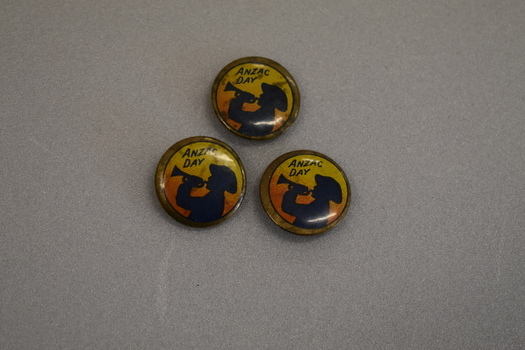 Badges were sold on trams, buses, at railway stations, other public buildings and at rallies held on or about ANZAC Day. These badges are a significant reminder of the many fund raising activities held in Australia to raise funds for the war effort. This is a cream-coloured piece of parchment paper containing details of the Will and Probate of Patrick White of Codrington who died in 1883. The paper is folded in two and the edges of the pages have blue lines ruled on them. There is handwritten material (black ink) on three of the pages. The seal of the Supreme Court of Victoria is attached with olive-green ribbon and there are five red stamps of the Master in Equity of the Supreme Court. The writing is fading in places but the document is readable. Tait collection: item 42 of 62 This is a document giving details of the Will and Probate of Patrick White, a farmer from Codrington who died in 1883. He left personal estate to the value of £316, with the beneficiaries being his wife, Eleanor and his son George. The lawyer concerned with this document was Ernest Chambers who had legal offices in Port Fairy, Koroit and Warrnambool at the end of the 19th century and the beginning of the 20th century. He had possession of this document and it was passed down to successive lawyers occupying the legal premises in Kepler Street, Warrnambool and located in this Kepler Street building in 2014. 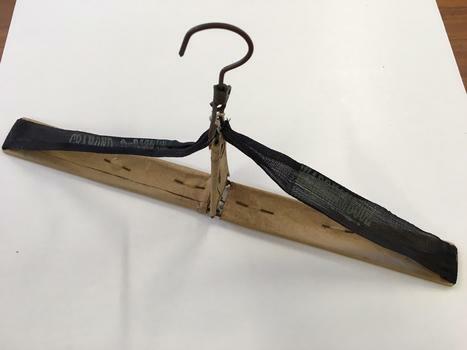 Folding coathanger with metal frame covered in brown paper with black cotton tape. John Glass Cramond 1829 and James Dickson 1831-1910 were founders of a large drapery store. Both were Scots and both came separately to Australia in 1852. Cramond initially came for gold but soon opened a store in St Kilda with a post Office attached and he was the first post master there. Dickson was a farmer’s son but became a draper and while he was unsuccessful on the Bendigo diggings and then returned to Melbourne where he met Cramond and soon after they opened a store on Lonsdale Street. They opened their business in Warrnambool in 1855 as a general store with groceries, drapery and ironmongery. Both partners were involved with the community and James Dickson was an original director of the Warrnambool Woollen Mill 1909 and the Warrnambool Cheese and butter factory. He also served on the committee of management of Warrnambool Base Hospital. This coathanger would have been used in their store. 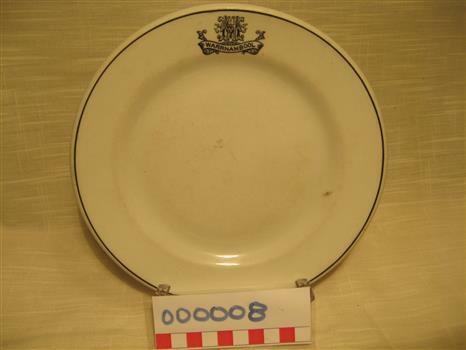 An everyday item linked to one of Warrnambool’s earliest and longest running businesses. Cramond & Dickson Warrnambool stamped on the cotton tape. This is a cylindrical stone jar with a buff-coloured base, a light brown top and a composite material screw topper. The top above the neck is bulbous-shaped and above this it is dome-shaped. A metal handle is attached to the neck. The maker’s information is on the sides in black printing. Part of this information includes a horseshoe-shaped scroll and a decorative pattern. There is a signature and other writing on the base of the jar in blue ballpoint pen. This item is a Sharpe Bros stone jar, presumably from the Warrnambool factory. The Sharpe Bros soft drinks factories in Australia and New Zealand existed from 1903 to 1972 and at one stage they had 35 factories. They were best known for their home deliveries of ginger beer and other brewed beverages in one gallon stone jars. The Warrnambool Sharpe Bros factory was established in 1919 and existed until 1951. It was situated at the old Rowley cordial factory at the corner of Banyan and Timor Streets. It was established by the founder of the Sharpe Bros business, John Sharpe. 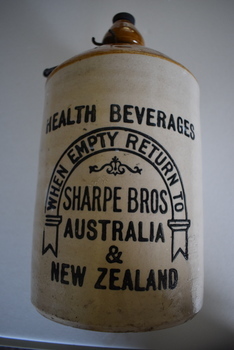 The signature on the base of the Warrnambool and District Historical Society Sharpe Bros jars is that of John H. Sharpe who for many years was the manager of the Sydney Sharpe Bros factories. He put the signature on the jars when he was visiting History House in Warrnambool in the mid 1980s. This demijohn is of considerable importance as it comes from the Sharpe Bros aerated waters factory, a business that was prominent in Warrnambool for over 30 years. Cordial manufacturing was an important industry in Warrnambool for over 100 years. 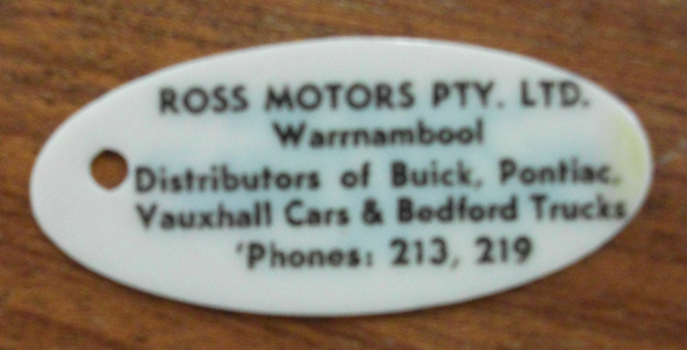 Key Tag - Ross Motors. Cream oval plastic disc for key ring. Black text. Ross Motors operated a car dealership in Fairy Street in the mid 20th century. They sold a number of different makes of vehicles as well as sales and service of milking machines and car accessories. A link to a Warrnambool business. Ross Motors Pty Ltd Warrnambool. Distributors of Buick, Pontiac, Vauxhall, cars and Bedford trucks. Phones : 213, 219. On Reverse: Finder of these keys please return to address on reverse side. .1 Shield shaped metal and enamel badge with green border including text enclosing a silver area featuring raised images of a torch, scales, compass, hammer, nails, artist's palette, brushes , a bar and the numbers 192. A pin clip is on the reverse .2 Circular metal and enamel badge with a golden edged green border surrounding a bronze coloured centre with a stylised golden edged scarlet torch and three horizontal bars of varied length. A pin clip is on the reverse. 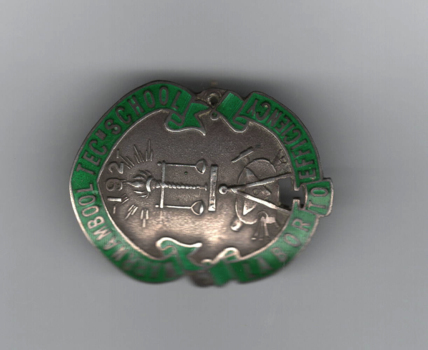 This is a Warrnambool Technical School badge of the 1920s and 30s. Warrnambool Technical School was established in Timor Street in 1913. The senior section was later called Warrnambool Technical College and then Warrnambool Institute of Advanced Education. The latter institute moved to Sherwood Park, Warrnambool and became the present-day Warrnambool campus of Deakin University. Warrnambool Technical School moved to Caramut Road, Warrnambool and is today known as Brauer College. The badge was donated by Mirth Marfell, the daughter of Henry and Helena Marfell. She was born in Warrnambool in 1919. Her grandfather, John Marfell, a Warrnambool hay and corn dealer and miller connected to the Warrnambool Co-operative Milling Company, was prominent in community and civic affairs in the town. Mirth Marfell completed her nursing training at the Warrnambool Base Hospital and served in the Australian Army Nursing Service in World War Two for five years. She then became the first Australian nursing organizer for the Victorian Royal College of Nursing. This badge is of interest, firstly as a memento of Warrnambool Technical School from the 1920s and 30s and secondly because it came from Mirth Marfell, a Warrnambool person who had a distinguished nursing career. This is a horse riding crop. It has a rounded wooden stick with interwoven material around one section and the remains of a string handle. The end of the stick has a leather tongue or keeper. There is a knob at the top end of the stick with a brass disc inserted with the name of the owner. The riding crop is much worn and stained. Riding crops are used as a controlling mechanism by horse riders – to regulate the speed of the horse etc. This one was owned by J.C. Lumsden was a jockey in Warrnambool. JC Lumsden or John Calder Lumsden lived at 7 Nelson Street Warrnambool with his parents, father also JC Lumsden. John junior was an amateur jockey in 1950's and sixties and was also a distinguished show rider in "flag races"and the like, winning at local shows and the Melbourne Show. He was also a leading race horse trainer at Warrnambool. This item may well have been his fathers. Although we have no record of where this item came from the following information has recently been uncovered. JC Lumsden or John Calder Lumsden lived at 7 Nelson Street Warrnambool with his parents, father also JC Lumsden. John junior was an amateur jockey in 1950's and sixties and was also a distinguished show rider in "flag races"and the like, winning at local shows and the Melbourne Show. He was also a leading race horse trainer at Warrnambool. This item may well have been his fathers. This item has a cast iron base in a pyramidal shape with the four sides having identical scrolls and star shapes. A piece of brass attaches the base to a violet-coloured bowl. The bowl contains a white wick. The brass wick holder has an external knob for regulating the light intensity. There is more brass between the bowl and the mantle which is made of plain glass. There is no known history attached to this item. 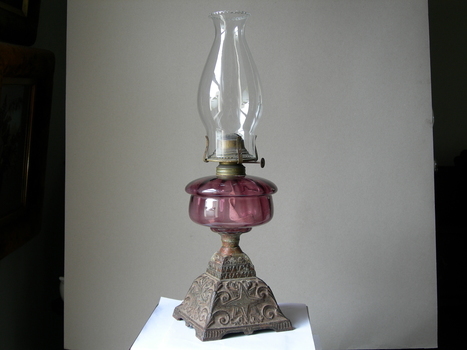 Lamps such as this one were common household items in the 19th century and the first three decades of the 20th century until electrical lighting became common in most households. This item has no known local provenance but it is useful for display as an item that was common in households in the past. This is a hand-sewn child’s dress made of embroidered silk. The dress has a Peter Pan collar made of satin with a fluted satin band around the waist. The long sleeves are set in and the top has three press studs to close the opening at the front. The material is gathered at the waist and hemmed at the bottom. The material is yellowed from age and stained in places. 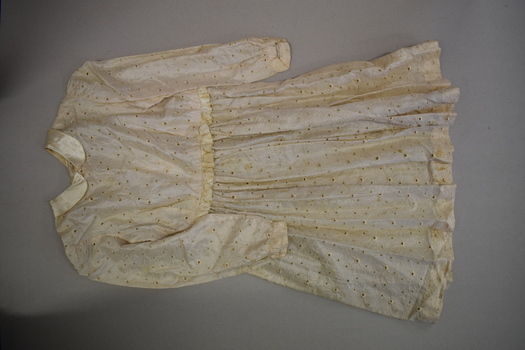 This dress was donated by Judith McShane, the daughter of Ena Heazlewood, the maker of the dress. 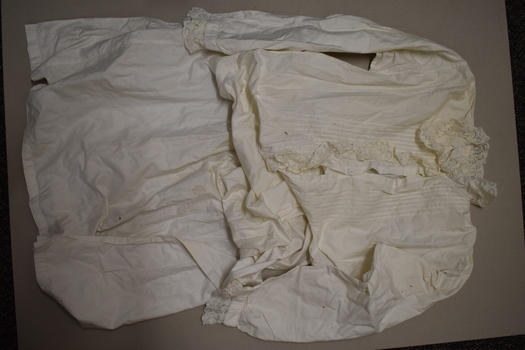 It was the First Communion dress worn by the daughter, Judith about 1952. Mary Josephine (Ena) Todd was born in Warrnambool in 1920. She was a hairdresser at Josephine’s Salon in Warrnambool and in 1942 married a Warrnambool man, Jack Heazlewood, a stoker on the H.M.A.S Sydney at the time. They later lived in Sydney. The material for this First Communion dress was brought back from Japan by Jack Heazlewood, on naval duties there at the end of World War Two. This is a post card from World War One. It has a written message on the back from Private George Hall to his niece Myra and it has a piece of embroidery on the front of the card. 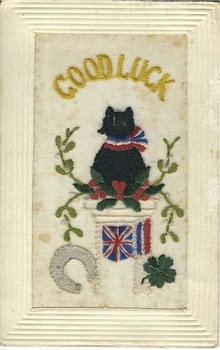 This depicts a black cat with the British colours of red, white and blue around its collar and other ornaments – a white horseshoe, a Union Jack, a white pedestal and red, green and white greenery. The words ‘Good Luck’ are stitched in yellow. The stitching is on white silk which is somewhat stained. There is a crimped border in lightweight cardboard around the embroidery. The message on the back is written in pencil. This post card has been sent from a military camp in England by Private George Hall to his niece Myra. Private Hall was a farmer from Purnim who enlisted in August 1915 (14th Battalion, 15 Reinforcement Group). He was aged 30 at the time. He left Australia in 1916 and transferred to 3 Field Artillery Brigade. He returned to Australia in 1919. The card gives no details of Private Hall’s activities at the time but indicates that he had sent several post cards to members of his family. ‘Dear Myra, Just this P.C. to let you see I have not forgotten you. Hope you are quite well. I have sent you & Dorry a lot of P. cards from England. I hope you get them all right. Your poor old Uncle George, 4821, 40 Bat. Worgret Camp, Wareham, Dorset. Wishing you all a very Merry Xmas & Happy New Year XXXX Nov. 24th -11-16. This is a metal Morse Code key with an oval metal base. It has three screws inserted in the base and two more screws attached to the sides of the base. There is a key lever on top of the base and this is adjustable. The hinge on which the key lever sits is missing. The lever has a round black knob at one end. This is a Morse Code key. Morse Code is a method of transmitting text information using short and long signals (‘dots and dashes’). It is named after Samuel Morse, the inventor of the telegraph and was developed in the 1860s. It was used extensively in the 1890s for early radio communication before it was possible to transmit voice and continued to be used in the 20th century along with voice transmission , especially by amateur radio persons. It was also used in military and naval communication but not so much today. 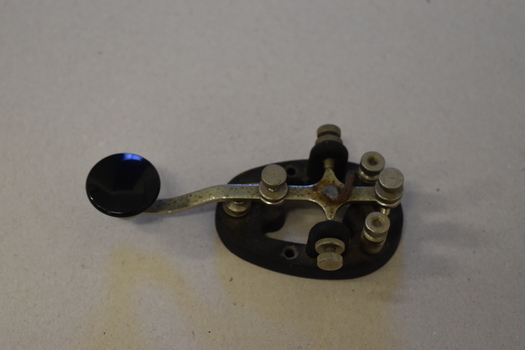 It is believed that this Morse Code key belonged to Ted Salamy, a jeweller and the first person in Warrnambool to hold an amateur radio licence (1924 Call Sign A3AJ, the 35th licence issued in Victoria). This Morse Code key is of interest as an object more used in the past, especially by amateur radio persons. It is believed to have been the property of Ted Salamy, the first person in Warrnambool to hold an amateur radio licence. This is a soft cover booklet of 162 pages. It has a pale blue cover and is bound with black tape. 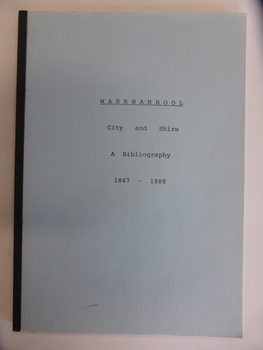 It has a map of Warrnambool city, an Introduction, an alphabetical listing of publications concerning Warrnambool City and Shire and an Index. 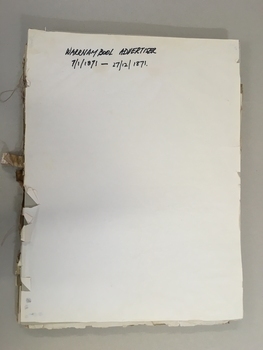 It has some photocopied black and white photographs of Warrnambool (untitled) and a reproduction of the front cover of Osburne’s History of Warrnambool. This 1989 booklet contains lists of publications connected with Warrnambool and District and it was compiled by W. Pinson and M. Johnstone. The publications listed were ones held at the time by the Warrnambool branch of the Corangamite Regional Library Service and the Warrnambool Institute of Advanced Education library. The publications are listed under the headings of Community, Environment, Heritage, Industry and Tourism. Although the information in this book is well out-of-date, it may be of interest to researchers today. The publications may still be available at the Warrnambool Library or at the South West College of TAFE in Timor Street Warrnambool or at Deakin University in Warrnambool. This is a khaki felt hat with a wide brim The crown is folded in 4 sections with four eyelets. There is a brown leather band around the crown and a silver-coloured buckle and two silver studs. The band is adjustable and a piece of string with a knot is used for adjusting the chin strap and for hanging the hat on a peg. The chin strap is made of plaited leather and the inside is slightly stained. The hat is slotted into a wooden frame made of varnished plyboard. The frame is U shaped with two straight sides. A smaller added section of plyboard has been placed on top of the frame and this has an opening at the top to allow the hat brim to slot into the frame. This frame appears to be home-made. This hat is one worn by members of the Boy Scouts. Warrnambool today has two Boy Scout groups and Allansford has one. The Warrnambool Tooram group has halls at the corner of Banyan and Timor Streets and in Otway Road and the Warrnambool Norfolk group has its headquarters at the corner of Kepler Street and Raglan Parade. 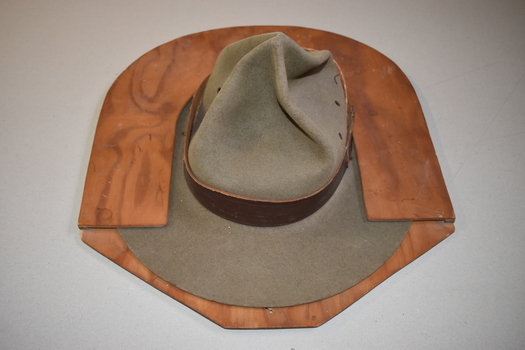 This hat is of interest as an example of the hat worn by scouts in Warrnambool in the 20th century. The same type of hat is still worn by Boy Scouts today. Vol 18 No 5. May 1 1940. This is a mottled brown-coloured wooden walking stick, slightly tapered and with seven segments. It has a wooden knob at the top curved and indented in an acorn shape. The knob has silver coloured nails or tacks driven into the raised sections. The knob lifts out and is actually a wooden ruler with silver casing at the top of the ruler. Also at the top of the ruler, at a right angle to the ruler, is a lift-out metal piece which has a spirit level at the top end and this metal piece is used to rest on the horse to estimate its measurement in hands. There is a leather strap near the top of the walking stick for attachment to the wrist and a gold metal cap at the bottom of the stick. A silver band near the top of the stick has an inscription. 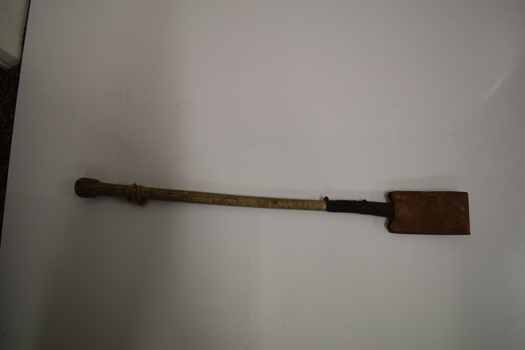 This walking stick, which is also a horse measurer, belonged to Atwell George Bendall, the well-known racing man, judge and handicapper in the Western District early in the 20th century. Born in the Caramut district, he was the manager of the ‘Green Hills’ estate at Winslow, a property owned by his father who also operated a livery and coach service at Caramut. When his father died Bendall carried on the family business until the end of the 19th century when he went to live in Warrnambool. A lover of horses, Bendall was an amateur rider of note and an owner of several racehorses. He also took a keen interest in coursing and owned and bred many successful dogs. In Warrnambool he took an interest in trotting and owned several trotters. For the last sixteen years of his life Atwell Bendall was a handicapper for most of the Western District race clubs and his keen judgment and knowledge of horses were greatly admired and appreciated. He was also a judge at agricultural shows and other horse events and this is probably where he was made use of this horse-measuring walking stick. He died in 1922. This is a most significant item as it belonged to the prominent early 20th century horse racing identity in the Western District – Atwell Bendall. 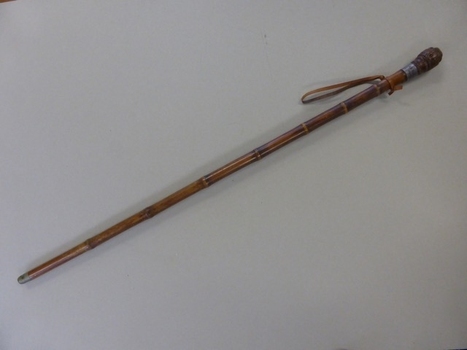 It is also of general historical interest as an ingenious object – a walking stick doubling as a horse measurer. This is a clear drinking glass in the shape of a goblet with a round base and an elongated body with a round opening at the top. The crest of the school is impressed onto the glass in gold outline. 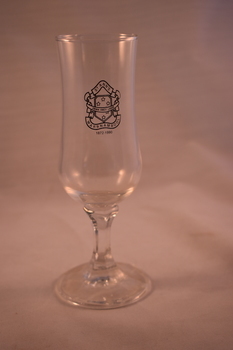 This glass has been issued to mark the end of the name of St. Ann’s College, Warrnambool in 1990 and the school’s amalgamation with the Warrnambool Christian Brothers College in 1991. St. Ann’s School commenced in 1872 and was then known as St Mary’s Convent of Mercy School, Wyton. The latter name was the name of the ex-John Ardlie home in which the school was then situated. There were eight foundation Sisters of Mercy. In 1888 the name was changed to St Ann’s School and in 1991 it amalgamated with the Warrnambool Christian Brothers College to form Emmanuel College. This glass is an interesting memento of the year that the name of St Ann’s College in Warrnambool ceased to exist. This is a hardcover book of 635 pages. The dust cover is multi-coloured with an image of a painting of the woolshed at Rich Avon on the front. The book has a dark red cover. This is the story of Thomas Guthrie (1833 -1928) and his family and their pioneering adventures in early Australia (mainly in the Wimmera district of Victoria and at ‘Avon Downs’ south of Burketown in the Barkly Tableland in the Northern Territory). It documents what has been described as the longest drive with sheep in Australia, the droving of 11,000 sheep from the property ‘Rich Avon’ in north west Victoria to ‘Avon Downs’. This was a 3,500 kilometre journey that took 16 months, commencing in 1882. The book is of interest because it documents the development of sheep farming in Victoria in the 19th century and the fortitude and resilience of the early pioneers. 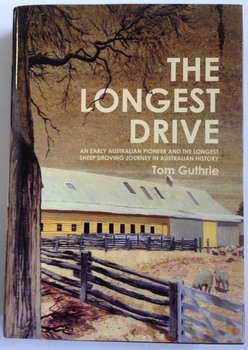 The story of the ‘longest drive’ is compelling and enlightening and is an important social history of interest to readers and researchers. 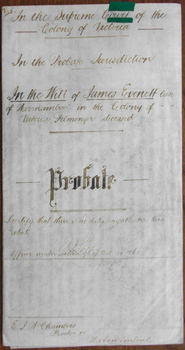 This is an 1898 document containing the Probate papers of James Evenett. The paper has been folded in two with handwritten material on four sides. There is a seal of the Supreme Court of the Colony of Victoria attached with a green ribbon and a red stamp of the Master in Equity of the Supreme Court. The writing in brown ink is legible but the paper is somewhat stained in places. Tait collection: item 18 of 62 This document contains information on the Probate papers of James Evenett, a fellmonger from Warrnambool. He died in September 1898. James Evenett had a fellmongery on the Merri River, commencing business about 1869 and continuing in to the 1890s. In the 1880s his woolscouring works employed four people and this increased to ten at the busy times. He purchased sheepskins from the neighbouring farms and sent the wool to England with the skins being used in the Merri River tannery works. He left real estate property to the value of £686 and personal estate to the value of £200. The three executors were William Ponting, James Harman and his wife Mary Evenett. Two solid cast iron rods of cylindrical shape with one flattened edge with name imprinted. Hollowed out section on one end. Dutton and Wiggs operated a brass and iron foundry known as the Warrnambool Brass and iron Foundry situated in Timor St. .Mr Dutton was a mechanical engineer and Mr C Wiggs was an experienced foundry worker. They were innovative in their work and also manufactured a large number of everyday items such as verandah posts, brackets and milk aerators. The significance lies in the fact that the items were manufactured in Warrnambool by a well- established local business. S. Wiggs W,bool. One has the number 7 and the other 5 cast into the metal. These nine tools are small wooden planes, similar in size and design. In each tool the main wooden section is rectangular in shape with an additional wooden piece attached to one side. In each a metal blade has been inserted at an angle into a slot on top of the main wooden piece and a small wooden piece rests on the blade. The blade protrudes at the base of the main wooden piece to form a planing mechanism. These items are among several tools that are believed to have belonged to the Warrnambool carpenter and businessman, Henry Phillips. English-born Henry Phillips (1821-1896) came to Australia with his wife Elizabeth in 1849. They lived for some time in Port Fairy. In 1865 Henry formed a partnership with Christopher Beattie and established the Warrnambool undertaking business of Beattie and Phillips. This business continued on after the deaths of the founders and lasted until the year 2000. In Warrnambool Henry Phillips was involved in the management of the Mechanics Institute. This is a hard cover book of 252 pages. The cover is green with an image of a quill pen on the front cover. The book has a preface, a contents page, 33 essays by Walter Murdoch and an index. There are no photographs or illustrations to accompany the text. This book contains essays written by Walter Murdoch in 1935. Walter Logie Forbes Murdoch (1874-1970) had a distinguished academic career and became Australia’s best-known essayist. He was a household name to two generations of Australians through his radio broadcasts and syndicated literary columns in several Australian newspapers. In 1901 Walter Murdoch came to Warrnambool, going into partnership with James Scott, the Headmaster of Warrnambool College. They bought out Stanley’s Warrnambool Grammar School. When Scott retired Murdoch became the sole owner and Headmaster of the school. While in Warrnambool Murdoch wrote a textbook, ‘The Struggle for Freedom’, a book which covers English constitutional history and has chapters on Australian government at all levels including the new Federal Government. In 1904 Murdoch left Warrnambool to take up a position lecturing in English at Melbourne University. He went on to become the foundation Professor of English at the University of Western Australia and later its Chancellor. Murdoch University in Western Australia is named after him. 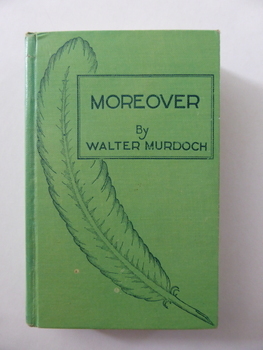 Murdoch published over 40 books, one of which is the collection of essays called’ Moreover’. He was knighted in 1964. This book is of interest as an example of the writings of Walter Murdoch, an important Australian literary figure who was a resident of warrnamboo and proprietor of a private school in the town in the early 1900s. Inside front page: A bookplate with the name ‘Dot’, a sketch of a Father Christmas and ‘25/12/35, Merry Xmas! Collin’. This is a hard cover book of 424 pages. The cover is dark blue with gold lettering and gold scroll work. The book has a preface, 42 chapters of sea stories and, at the back of the book, several pages of advertisements for other books published by Ward, Lock and Co. There are many black and white sketches scattered throughout the text. The inscriptions are handwritten in black ink. 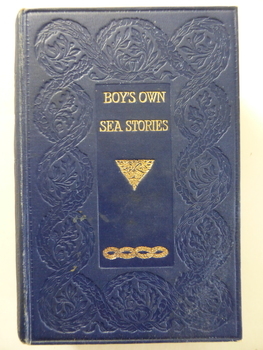 This book of sea stories belonged to C. Simpson of ‘Elm Bank’, Wangoom. Charles Simpson was a farmer at Wangoom in the 1860s. The township of Wangoom is about ten kilometres from Warrnambool. Charles Simpson was the brother of George Simpson of Nullawarre and William Simpson who had a drapery store in Warrnambool. The owner of the book would be a descendant of one of these early settlers. This book is of interest as it belonged to a member of the Simpson families, several of whom were early settlers in the Warrnambool district. 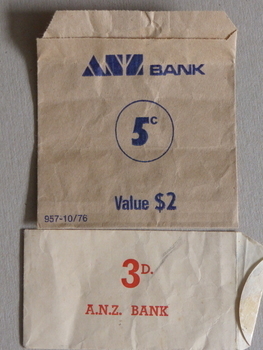 These are two paper envelopes, glued at the ends, one for holding five cent coins and the other for threepenny coins. They are buff-coloured, with the larger envelope having blue printing and the smaller one having red printing. These enveloped have been used by the A.N.Z. Bank as a convenient way of storing coins. The one containing threepences is pre-decimal currency (1966) and other (five cents) is post 1966. The envelopes would have been used in all ANZ banks. The ANZ Bank was formed in 1951 when the Bank of Australasia merged with the Union Bank. The Bank of Australasia was established in Warrnambool in 1854 and in 1953 the Bank of Australasia and the Union Bank closed and the ANZ bank opened in Timor Street. Today a branch of the ANZ bank is in Liebig Street. These envelopes are of minor interest as examples of the currencies and banking procedures of yesteryear. Large photograph glued to the top of the card with text in various styles underneath. Photo is sepia and card is cream. The bottom part of the piece has broken away. Jordan in bottom LH corner of photograph. “L.N. Moore 2 Landcox St Nth Brighton” written in pencil on back.